Keep Porcelain Veneers in Coral Ridge Sparkling and Strong! The secret is porcelain veneers! Porcelain veneers in Coral Ridge work to cover your most unwanted flaws. They’re so effective that even your most idolized stars have admitted to getting them to boost their confidence up on the big screen. Learn more about veneers and how to maintain them in this week’s blog post. It’s true that these sheaths of high-quality dental porcelain can be used to create your perfect smile, but just because you’ve met your goals aesthetically, doesn’t mean they’ll last forever without excellent maintenance. When you get veneers, you’re neither more nor less likely to experience tooth decay or cavities, but if your oral hygiene habits decline, you’re still susceptible to developing a dental problem. Why? Your natural tooth still exists beneath your veneers, so they still need to be cleaned regularly. Here are a few helpful tips to keep your veneers—and natural teeth—healthy, strong, and attractive! If you want your new smile to last long, you must keep your teeth and gums healthy. Excellent dental hygiene directly effects the lifespan of your veneers (and your natural teeth of course). 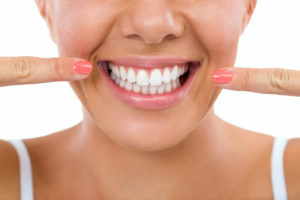 Brushing twice a day, flossing once a day, along with professional cleanings at with your cosmetic dentist in Coral Ridge will keep your natural teeth healthy and your porcelain veneers in great condition. A well-balanced diet can also keep your teeth strong and cavity-free. Try to stay away from snacking often because most snacks are high in carbs and sugar. These substances can linger on your teeth. A diet is high in carbohydrates can lead to a higher probability of tooth decay and dental carries, even with veneers. Even with your natural teeth, you should avoid biting objects that put your teeth at risk for cracking, fracturing, or chipping. But this is especially important with veneers. Your veneers will eventually tear, chip, or break from this bad habit—plus you’re putting your natural teeth at risk for trauma, too. Visiting your dentist every 6 months is very important to the maintenance of your veneers. A dental professional can monitor your porcelain veneers, teeth and gums, and check for potential problems. Plus, during your appointment, your dentist can use x-rays to see if there have been cavities forming beneath your veneers. And who doesn’t want their veneers and teeth to be cleaned and shiny? With the maintenance in mind, you can probably see that veneers are an easy way to achieve and keep your perfect smile. When you get veneers, you need a team behind you to help you maintain them. Here at Mingel Dental, we take pride in offering patients personalized experiences that fit their needs. That’s why we believe in providing opportunities for one-on-one consultations and follow up appointments to meet your needs. Feel free to call us today to schedule your next visit! Comments Off on Keep Porcelain Veneers in Coral Ridge Sparkling and Strong!